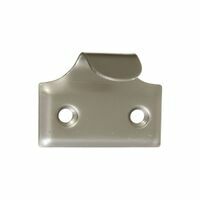 Bar-type pull/lift designed for windows, cabinets, doors, drawers, etc. Offers attractive, easy-grip design. Fits a variety of applications. 4" length. Visual-pack. Sash lift with 4" length x 1-1/8" width. Features solid construction for increased strength. Mounting hardware included. Slim pak - polybagged.